Scan and Plan is an initiative created around your physical health. It contains targeted exercises/stretches for you. The results of your scans allow us to tailor a care plan for you. Use the links below to see pictures & descriptions of exercises that will help you with your neck, back etc. In a standing position, tuck your chin into your chest and hold. Then look above your head as far as you can and hold. Bring your ear to your shoulder and hold and then repeat on the opposite side. Finally look over your left shoulder and hold, then proceed to look over your right shoulder and hold. Hold each position for 10-15 seconds. Complete each movement 3 times. Ensure you are just moving your neck and not your back or shoulders. Place your hands behind your neck and interlock your fingers. Keep your elbows close together as if you have a pencil in between them. Draw the figure of 8 with your elbows. Repeat 5 times. Standing straight, try touch your shoulder with your ear. Use your hand to place some downward pressure on the head and hold for 15-20 seconds. Repeat on opposite side. Complete 3 times each side. With your hands behind the body as seen in the picture, try touch your shoulder with your ear and hold. Repeat on the opposite side. Lying on your back, bring your two knees up to 90 degrees, and your two hands straight up in the air. Drop you right leg down to the ground but keeping it an inch from touching the ground, along with your left hand at the same time. Return to the starting position and repeat on the opposite side. Complete this movement 5 times on both sides. Start on the floor on your hands and knees. Lower your forearms to the floor with elbows positioned under your shoulders and your hands shoulder-width apart. If someone looked at you from the side, your arms would form a 90-degree angle. Step your feet back, one at a time. Maintain a straight line from heels through the top of your head, looking down at the floor, with gaze slightly in front of your face. Hold for 20-30 seconds. 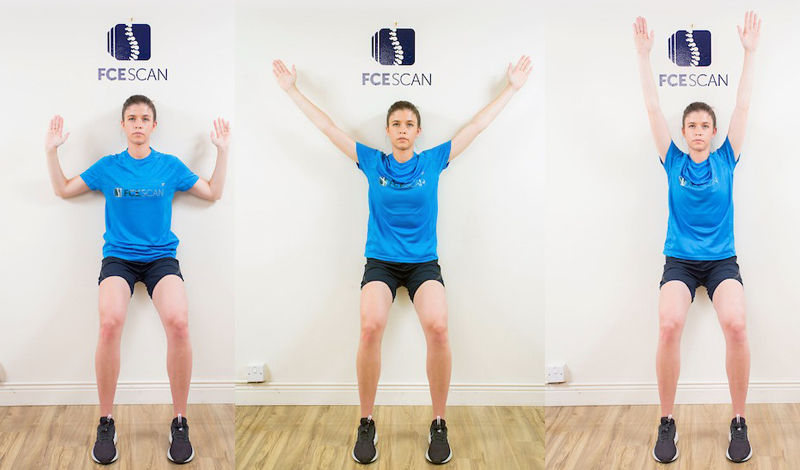 Using a wall, get into a seated position with your back fully supported by the wall. Bring your arms back to the wall, with elbows and the back of your hands constantly touching the wall. Slide your arms into the position of a W, followed by a Y, followed by an I. The key here is to ensure the arms are touching the wall or as close as possible at all times and that they don’t move forward too much. Hold each position for 5 seconds and repeat each position 5 times each. Using a Swiss ball, lie across it sideways with both feet staggered. Reach overhead with one arm while keeping the opposite hand on the ground for stability. Hold for 15-20 seconds and repeat on the opposite side. Complete 3 times on both sides. Lying on your back, pull both knees towards your chest and hold for 15-20 seconds. Repeat this 3 times. 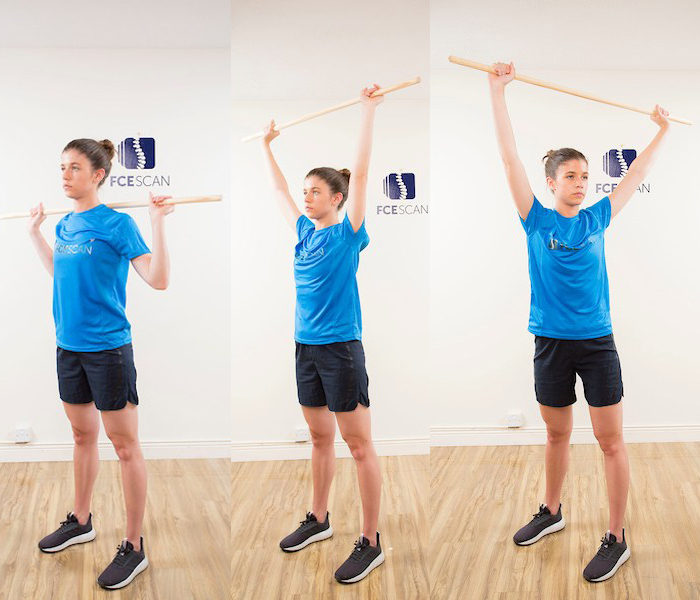 Using a broom handle, lock the arms out overhead. When locked out rotate to the left and hold for 10 seconds, return to centre and rotate to the right and hold for 10 seconds. Repeat this 5 times both sides. Start by lying on your stomach and lock out your arms to arch your back. Slowly look over your left shoulder and hold. Return to centre and look over your right shoulder and hold. Using a broom handle or equivalent, place your hands directly overhead while locking out the arms. Keeping your feet facing forward, rotate your upper body anti-clockwise to the point of restriction and then back to centre. Repeat this in the opposite direction. When facing forward, bend down to one side and hold before repeating on the other side. The key here is to make sure your feet stay planted to the ground when rotating and ensure these movements are dynamic. Place one hand behind your head and reach between your shoulder blades. Using the opposite hand, push down the elbow to increase the stretch. Hold for 15-20 seconds and repeat on the opposite side. Complete 3 times on both sides. Using a wall, place the palm of your hand on a wall as far behind you as you can. Keep your head, hips and feet facing forward as seen in the picture. To increase the stretch, stand closer to the wall. Hold for 15-20 seconds and repeat on the opposite side. Complete 3 times on both sides. Bring your arm directly across your body while keeping it straight. Use the opposite arm to keep it as close to your chest as possible. Hold for 15-20 seconds and repeat on the opposite side. Complete 3 times on both sides. Using a broom handle or equivalent, place it directly behind your head resting on your shoulders. Press the broom handle directly up in the air while trying to stop your arms from coming forward. Once the arms are locked out, slowly bring it back to the starting position behind your head. The key here is not to bring your neck or arms forward while doing this exercise. Repeat this 10 times. Similar to the front plank only on one side. Use the elbow as your support. Ensure your body is in good alignment from neck to toe. Hold for 20-30 seconds and repeat on the other side. In a standing position with legs kept straight and locked out, reach down to touch your toes or as close as possible and hold briefly. Then begin to reach up overhead and as far back as your can and hold briefly. This movement is dynamic and there should be constant movement in both directions. Standing straight, place one hand behind the other and reach as far forward as possible with both arms locked out. Hold for 15-20 seconds. Using a foam roller, place it directly behind your upper back while lying down. While having your knees bent, look directly over your head. Hold for 15-20 seconds. Repeat 3 times. 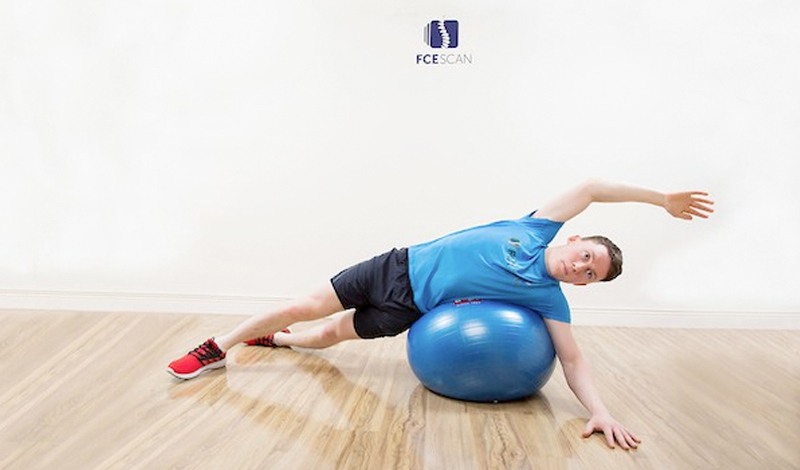 A progression from the normal front plank only using the Swiss ball. Using a broom handle or equivalent, hold it out in front in a Warriors pose (see picture). While keeping your feet and head facing forward, swing the broom handle out over one shoulder (as if you are using a shovel to throw away some dirt). We want the spine to rotate here so this movement is dynamic (always moving). Use the arms to really swing the broom away while also rotating the spine but keep the hips facing straight ahead. Complete 10 rotations and then repeat on the opposite side. Using a wall, stand back approximately 1 metre and bend forward at your hips. Place your two hands on the wall just above shoulder level as seen in the picture. The position of your torso and legs should make a 90 degree angle. Ensure your back is flat and parallel with the ground here. Place the hands higher up/ lower down on the wall until you can feel the stretch. Hold for 15-20 seconds before relaxing. Complete this 3 times. Place your two hands and feet on the ground with your knees locked out. Bring your left foot up beside your left hand on the outside. Rotate your right hand up overhead before returning it to the ground. Repeat this rotation 5 times. Return your left foot back beside the right and then repeat on the opposite side. In a kneeling position, place one hand on the back of your head with the other remaining on the ground. The elbow should be pointing directly towards the ground. Slowly bring this elbow towards the sky until you reach the point of restriction. Return to the start position and repeat 5 times. Repeat on the opposite side. Complete 3 times on both sides. In a kneeling position with the hands on the ground, increase the rounding of your lower back by tilting your pelvis anteriorly (towards the ground). Then increase the rounding of your upper back by tilting your pelvis posteriorly (towards the sky). See pictures for correct movements. Repeat this tilting in opposite directions 10 times. Using a resistance band around the knees, lie on one side resting your head with your hand. Keeping your feet together, pull your knee towards the sky and away from the other against the resistance of the band. Hold at the top for 5 seconds before returning to the start position. Repeat this 10 times before completing it on the opposite side. Using a resistance band placed around the ankles, step away from your body with your left leg as far as you can and plant it down. Once the left is planted bring your right over beside it. Continue this movement in the same direction (depending on the size of the room/hall). Once you have completed 10 steps in one direction, go back in the direction you came from. If space is limited, you can just alternate with every second leg. With feet shoulder width apart and slightly pointing out (10 to 2 direction), sit back on your heels. This may be difficult to do, therefore go to the point of restriction. Use a wall or similar to hold yourself from falling back. Ensure the knees are directly above the toes and the back is not rounded. Hold the position for 10 seconds before standing up straight again. Complete 3 times. Lying on your back with both feet flat on the ground and knees bent, raise your hips up towards the roof and squeeze the glutes. The key is to have a straight line between neck and knee. Hold for 10 seconds and relax. Repeat this 10 times. To make this more challenging, complete on one leg at a time. Sitting in an upright position, bring one leg towards your chest and plant the foot at the other side of the opposite leg. Gently pull the flexed knee towards the opposite shoulder and hold for 15-20 seconds. Repeat on the opposite side. Complete 3 times on each leg. With both hands on hips, step forward with one leg and genuflect until the rear knee is on the ground. Lean forward into the leading leg and hold for 15-20 seconds. Repeat on the opposite side. Complete 3 times on both sides. Starting in the deep squat position, try touch your toe with the opposite knee and return to centre. Repeat on the opposite side. Keep your torso upright and facing straight ahead, while just using the legs and hips. Using a resistance band, placed around the soles of both feet, raise your knee up into the air and hold for 5 seconds before returning to the ground. Repeat this on the opposite side. Complete 5 times on both legs. Using a chair, place one leg up on it in a flat position. With your hands on your hips, just lean forward to the point of restriction and hold for 15-20 seconds. Keep the standing leg locked out. Repeat on the opposite leg. Complete 3 times on both sides. Start in a kneeling position with both hands overhead holding a broom handle or equivalent. With minimal side movement, bring your right leg up in front of you to a half kneel position and return to starting position. Repeat on the opposite side. Keep arms overhead and locked out at all times. Complete 5 times on both legs. Start in a quadruped position (on all fours) raise your right arm out in front of you and your left leg straight out behind you and hold for 5 seconds. Return to start position and repeat using the opposite limbs. Complete this 5 times on both sides. Lying on your back, contacting onto the front of your knee with your hands you bend your knee to your opposite shoulder. Holding this stretch for 15-20 seconds and repeating three times. This can be repeated using the other knee too. Using a chair, place your right ankle on top of your left knee like in the picture. Use your hand to applying downward pressure on your knee to the point of restriction and hold for 15-20 seconds. Repeat on the opposite side. Complete 3 times on both times. In a quadruped position (on all fours), bring your left knee across your body until its directly under your chin. Your left foot should be between the right hand and right knee (see picture). To feel the stretch, reach you right foot away from your body and drop your hips towards the ground. Hold for 15-20 seconds and repeat on the opposite side. Complete 3 times on both sides. A regression of the squat. Use the ball to help you into the deep squat position. Lean away from your body with the right leg while keeping both feet facing forward. Bend the right leg and keep the left leg straight with the hands on hips. Hold for 15-20 seconds and repeat on the opposite side. Complete 3 times on both legs. Using a step/ fireplace edge etc, place both forefeet on the edge. With hands on hips, raise your body up while remaining balanced. Hold for 5 seconds and lower back down. Repeat this 5 times. This can be done single-leg to advance the exercise. Using a step/ fireplace edge etc, place both forefeet on the edge. Without moving your heels off the ground, just lean forward until you feel the stretch. With hands on the floor, lock out the leg you want to stretch and ensure the sole of the foot is flat on the ground. You can use the opposite foot to “pin” the heel down to the ground. Hold for 15-20 seconds and repeat on the opposite side. Complete 3 times on both legs. In a kneeling position, place one leg out in front of you and make sure it is straight and locked out with the heel on the ground. Reach forward towards the toe with both hands and hold. The key here is to keep the leg straight and locked out. Repeat on both sides. Kneel on the floor. Touch your big toes together and sit on your heels, then separate your knees about as wide as your hips. Lay your torso down between your thighs and reach forward as far as you can. Hold for 15-20 seconds before releasing. Complete this 3 times. Using a tennis ball or equivalent, place it under your big toe and lean forward. If your big toe is very rigid, start by using a golf ball. Hold in this position for 15-20 seconds and repeat on the opposite side. Complete 3 times both sides. Sitting on the ground and keeping the legs straight, place one heel resting on the opposite toe. Reach forward towards the toe as far as you can and hold for 15-20 seconds. Repeat on the opposite side. The key here is to keep both legs straight and locked out. Complete 3 times on both sides. Standing on both legs, with your hands on hips, hinge forward at the hips. It is important to keep the legs straight here and also the back. Once you feel your hamstrings stretch, hold this position for 15-20 seconds. Repeat 3 times. To ensure correct alignment, video yourself doing this movement and compare it to the picture. Standing straight, cross your legs as seen in the picture. Ensure the leg behind your body is straight (locked out). Reach down to the foot that crosses behind your body and hold for 15-20 seconds. Repeat on opposite side. Complete 3 times both sides. Kneel on the floor. Touch your big toes together and sit back on your heels. This may be very difficult to achieve depending on mobility, but go to the point of restriction and hold for 15-20 seconds. Repeat 3 times. Using a wall to balance, pull your foot with your hand towards your glutes. This may be more difficult for some depending on mobility. If you have restriction trying to hold your foot with your hand, you can use a towel as a lever. Hold for 15-20 seconds and repeat on the opposite side, Complete this 3 times on both sides. While lying on the ground, place a rope/band/towel around one leg. Pull this leg up in the air while keeping it straight until you reach the point of restriction. At the same time the opposite leg should be kept straight as possible on the ground. Hold for 15-20 seconds and repeat on the opposite side. Complete 3 times on both sides. Lunge away from your body to one and use both hands to touch the toe that is leaning away. Return to centre, bring both legs back to side-by-side and repeat on the opposite leg. Keep this movement dynamic (don’t hold the stretch). Complete this 10 times. Standing with hands on hips, raise one leg up behind you. Keep your balance for 30 seconds. Repeat on the opposite side. To increase difficulty, there are a number of options: close the eyes, pass a bottle/jar from hand to hand, stand on a pillow, constantly rotate your neck left and right. With hands on hips, raise one leg off the ground and squat using just the opposite leg. Ensure the knee is in line with the toe at all times. Repeat this 5 times before doing the same on the opposite leg. Standing on one leg, raise your opposite knee up in front of you to 90 degrees. Following this, the same leg should reach back behind you until as straight as possible. Your torso will begin to lean forward at the same time. The stretch will be felt at the back of the standing leg, as long as it is kept straight throughout. For assistance with balance you may use a broom handle or equivalent to hold onto. This stretch is dynamic and therefore should not be held for any prolonged period of time. 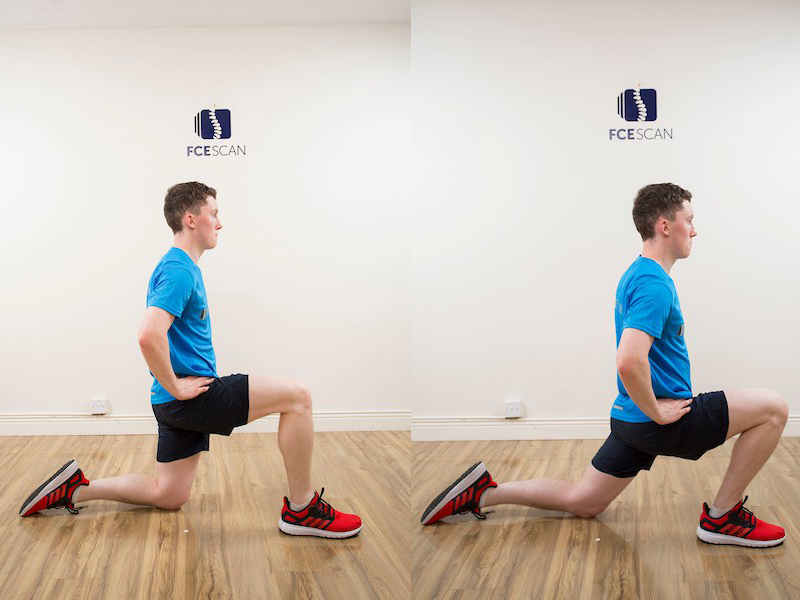 With feet in a staggered position, genuflect down until the knee is an inch above the ground and rise back up to the starting position. Repeat 10 times with the feet in that position. Switch the lead leg and repeat 10 times. In a half kneeling position, place both hands on the knee. While keeping the foot in the same position, push the knee across the body and hold for 5 seconds. Repeat this while pushing the knee away from the body and hold for 5 seconds before returning to centre. Repeat this 5 times on both legs. Using a swiss ball, place your two legs on top of the ball with your back and arms flat on the ground. Next, roll the ball towards yourself until your two feet are flat on the ball. The key here is to create a straight line from your neck to your knees. Return to the starting position and repeat this movement 5 times. Take a break and complete this 2 more times.